Four kids are driving through the desert on the way to the beach, their faces anything but cheery: this isn’t Spring Break. They’re trying to outrun the end of the world and each other. 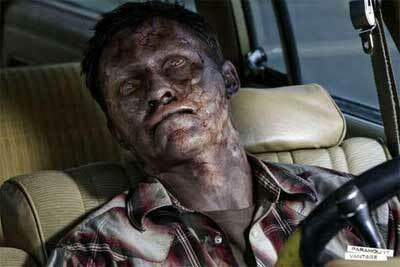 In Alex and David Pastor’s CARRIERS, no one is safe from the viral pandemic threatening to wipe out the human race. Determined to elude the deadly virus, Danny (LOU TAYLOR PUCCI), his brother Brian (CHRIS PINE), his girlfriend Bobby (PIPER PERABO) and Danny’s school friend Kate (EMILY VANCAMP) speed across the Southwestern U.S. to reach a place of possible safety. Over the course of four days, the group is faced with moral decisions that no human should ever be forced to face. 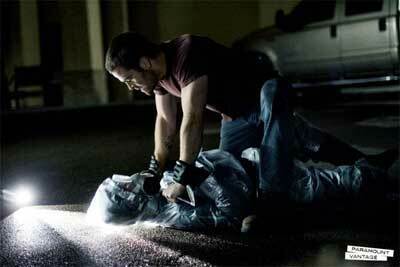 They discover that their greatest enemy is not the microbe attacking humanity, but the darkness within themselves. We’ve all been there before. At least in cinema that is. A viral outbreak …a world in chaos …a loss of hope …a disease…fatal consequences. Sound familiar? 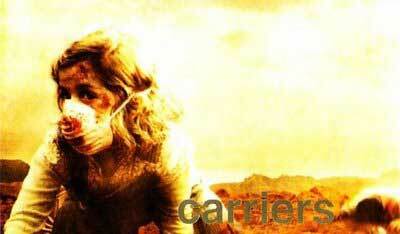 “Carriers” is another notch into catering to our fears of a pandemic or world outbreak. “Carriers” begins in a state that has already been in effect for some time. As they put it, this new way of life has rules: Avoid the affected, The sick are already dead, Disinfect everything and break the rules= you die! Our opener begins like most, a group of 4 young adults traveling the countryside. Though it only takes a few minutes before we are revealed the reality of the times and the espidemic at hand. 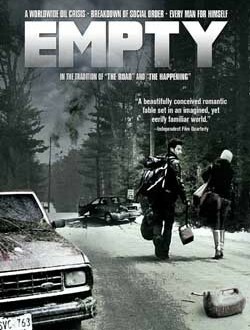 A stranded father and his daughter block the road and yet the travelers offer no assistance as they clearly have a new perspective on life. Differently this round is that these diseased aren’t zombies, killers or manic minded monkey infected attackers, they are simply diseasedand dying. Some hang on to word of a cure or serum that might be awaiting some further destination. The father and his child were on there way there. Running out of gas is not an option in the bare desert, so the 4 travelers Brian (Chris Pine), Kate (Emily VanCamp), Danny (Lou Taylor Pucci) and Bobby (Piper Perabo) approach the stranded vehicle to form a truce and get to the anticipated destination. Bleach is a pretty useful tool in ridding objects and materials of infections, other common items include face masks, gloves …or anything to keep the infection off of you. As they aid the father and daughter temporarily the moment is short lived as their need to survive takes over and leaves them astray. From this point on its a bit of a lets see what going on in the next town kind of journey. Playfulness is awarded with joking, playing golf per window smashing and a few let’s get it on moments. We get a real sense of them not really taking things too seriously beyond taking from those who are inflicted. Though this also opens the door for a rude awakening and slap in the face as the tables get turned. The film was directed by the team of Àlex Pastor and David Pastor. Emily VanCamp you may remember from the letdown film “Ring Two”…though its my guess that this one isn’t gonna rally put a star on her resume either. Carriers showcases a harrowing possibility that is not so absurd as being removed from fiction. In this sense it’s more sci fi than horror even though the diseased are pretty nasty looking. The horror of course in this case comes more from the human reaction to a level of current states that are more beyond their control than anything. And even with this evident uncontrollable outbreak, the film chooses to center only on one group of folks and what they encounter on the road. No government plots, no secret society, no heavy background recollections…just simple in its state of the moment. In all I have to say this was not my total cup of tea. The story has a direction which is the human factor but is void from any real action or plot line. In fact the plot line is pretty bare if you ask me centering more on the individual need to be survivalist caught up in self preservation. In this aspect there is alot of backstabbing, abandonment and disconnection. Simply this film drags at best and at the same time steals bits and pieces from a half a dozen other previous films. There is nothing to gain by watching this unless you’re more into the drama aspect (which I wasn’t). At first I thought maybe it was being promoted in anticipation of the “The Crazies” remake which of course follows a like minded path. For horror fans, there really isn’t much horror and even less action. I’m calling this a bit of a stinker and bore. Save your money stick with “Pandorum” or “Paranormal Activity” for new releases.